To succeed in music, you need to start off with the right instrument. 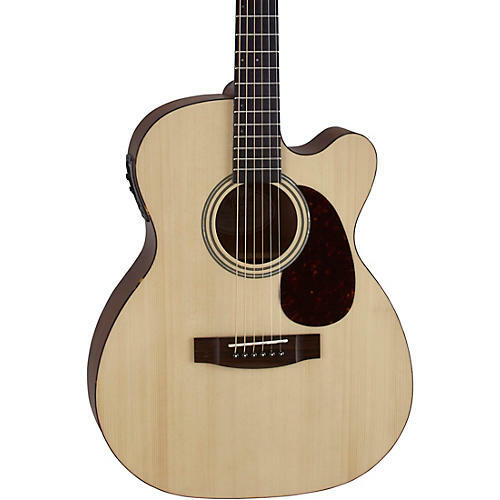 With that in mind, Mitchell created the Terra Series acoustic and acoustic/electric guitars, which includes this T313CE Auditorium acoustic/electric guitar. The Terra Series offers guitarists budget-friendly options with great looks and tone to inspire and keep players engaged on their musical journey. Unlike many other guitars in its class, the T313CE features a solid top, spruce in this case, paired with striped mahogany back and sides. Add to that an open-pore satin body finish and forward-shifted X bracing, and you've got a guitar with natural good looks that offers rich, warm tone with a detailed high end and deeper resonance right out the box. To give all players the best experience possible, the T313CE was crafted with a comfortable, satin-finished, slim-C neck design. This is ideal for younger players and those with smaller hands trying to familiarize themselves with sliding up and down the neck as they hone their skills. Experienced players will enjoy its familiar feel. Its rosewood fingerboard adds even more warmth and sweetness. Making the T313CE an even more versatile instrument, it comes with a built-in Fishman Presys preamp and Fishman Sonicore pickup. This gives you a simple 3-band EQ to better shape your sound when plugged in, as well as a phase filter control, volume control and a tuner. Its specially designed housing makes battery swaps stress-free. A simple push unlocks the preamp, which opens it up, giving you access to the battery underneath. With no clips to deal with, you can easily swap batteries and get right back to playing. Adding to its ease of use, Mitchell equipped the T313CE auditorium with high-ratio sealed gear tuners. This ensures quick, stable tuning for great performance every time you pick it up. Other appointments that separate it from most acoustic guitars in its class include a single-cutaway for more fret access, beautiful rosewood headplate overlay, abalone and multi-ring rosette, TUSQ nut and saddle, black pickguard, and a natural gloss top finish. Fill the auditorium or any room with the beautiful sound of this Mitchell. Order yours today.